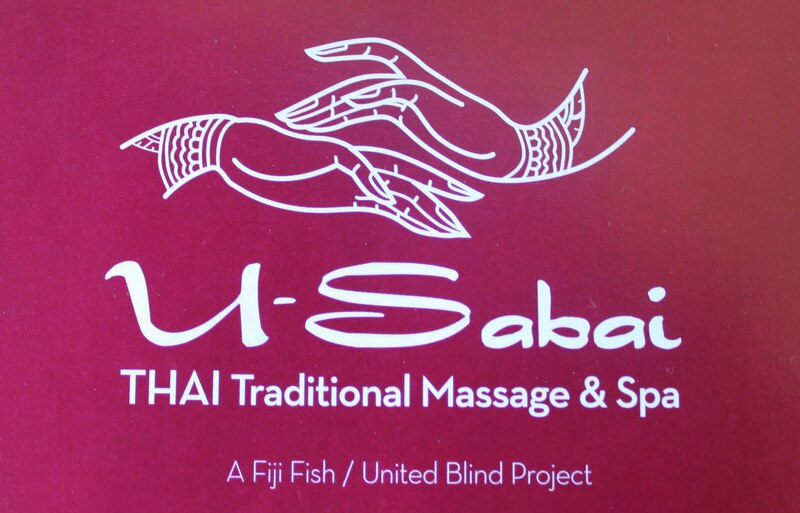 U-Sabai (meaning ‘Your Well-Being’), a joint venture of Fiji Fish and the United Blind Project is an inspiring spa treatment facility based in Suva, the capital of the Fiji Islands. The spa opened its doors in late 2010 and is Fiji’s first authentic traditional Thai massage centre with a twist…the therapists are visually impaired! According to owner Grahame Southwick “All the therapists there are either totally blind or partially. They specialize in Thai massage – which is something pretty unique to this part of the world”. The visually impaired employees received 12 months of intensive training by spa manager Phusanisa Malaipoung of Thailand. The driving force behind this unique spa is the desire to give Fiji’s blind community a meaningful and fulfilling career option. I visited U-Sabai for the first time a few days ago and was delighted by my experience. I was greeted so warmly by the staff that I was relaxing even before my treatment had begun! I’d opted for a foot massage which included a gorgeous footsoak, one hour foot massage in an uber-chilled out room while reclining in a comfy chair-bed, PLUS an extra head, neck and shoulder massage was included…..sigh….so good! After my treatment I was gently ushered into a room filled with treasures from Thailand including some amazing lighting fixtures and artworks. Here I was presented with a steaming hot cup of herbal tea and a hot towel for my face. Ummm….AWESOME! All of this came to the equivalent of around AUD$50.00 – what an absolute bargain! So if you ever find yourself in Suva, I recommend you drop in to U-Sabai for some serious relaxation – Thai-style! Kindness is in the bag!